Aimed squarely at decent for the price - the tablet seems to reach this relatively low bar. 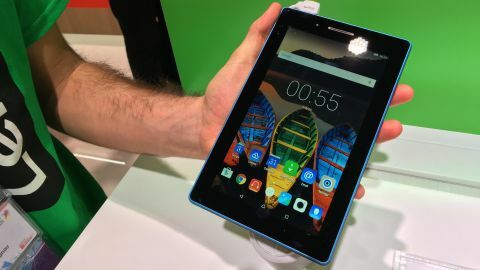 Lenovo has taken aim squarely at the family market with its low-cost Tab3 7 and Tab3 8 tablets - offering up a familiar Android experience with low-end specs at a low price. You can actually get the Tab3 8 for cheaper than the Tab3 7 if you plump for the Wi-Fi only option that's only available in the larger version (and around $99 - about £69 or AU$137). The LTE-toting Tab 3 7 comes in at $129 (around £91, AU$179) and the LTE 8 inch version $149 (around £105, AU$207). The Lenovo Tab3 10 joined the mix for £250, but has since been heavily discounted. Both the 7-inch and 8-inch tablets went on sale in June 2016, joined by the Lenovo Tab3 10 later in the year. The Key difference between the Tab3 7 and 8 is, as you have probably guessed, the screen - with the latter offering up an 8-inch HD display and the former a standard definition 7 inches. The 10-inch model brings a display of 1920 x 1200, making it the sharpest of the range too. These are not tablets built for the premium end of the market, and it shows. The tablets look and feel cheap - constructed of plastic and chunky in the hand. They do, however, feel relatively robust - not excessively creaky when you surreptitiously give them a bit of a flex. They're certainly not iPads - more something that you can fling around and not worry too much about. Let's be honest, these are not even going to be something you show off to your friends. The screen quality, even on the better HD Lenovo3 8, is just about acceptable - although the inclusion of software that can filter out some of the blue light is a nice addition as we seek to protect our kids from the eternal sunshine of the spotless tablet. This is just one of the kid-friendly features: Lenovo has sensibly included a kids mode that will let you leave the tablet in your young ones' hands without worrying too much about them stumbling into the dark corners of the web, and we're not talking about rival tech sites. Packing Dolby Atmos speakers is a nice touch for a tablet of this quality, but combined with the low-res screens isn't going to make for the most appetising movie marathon - think twice about buying these tablets if you're looking for a premium experience there. Powering the Tab3 7 and Tab3 8 is a 1GHz Quad Core chip which keeps things chuntering along. It's not exactly a Zippy experience but it's not Bungled either. There's a stingy 16GB of memory, so it's not going to be a media tablet you can get away with overloading for holidays. However, the Lenovo Tab3 7 also comes with an 8GB option - we would strongly recommend that you don't go for that option unless you're going to barely use the tablet at all. The internal software is going to take a chunk of that, and if you want to download any media or put more than a few apps on there, you're going to struggle. The Lenovo Tab3 range have been in the market for over a year now, and as such are coming down quickly in price. They don't pack the latest processors, nor have the most cutting-edge screen technology on board. They're clearly made as cheaper models that you can pick up easily, use briefly for a larger screen and forget about while you use your phone for more powerful applications. That said, if you can find them for a lower price and are just after a basic tablet for a loved one to sling in a gym bag or leave in a car, you could do a lot worse. We're anticipating our full review will be coming soon - keep an eye out for our extended tests and thoughts.